The techniques of Container Gardening and “bottom watering” instructed here are adapted from that employed by many commercial microgreen farmers who raise their crops in plastic containers that are manufactured specifically for growing seedlings. I owe my adaptation to Lauri Roberts of Farming Turtles Microgrens, based in Exeter, RI. Lauri graciously twice guided me on a tour of her indoor microgreens farm, and showed me how to grow microgreens cheaply, cleanly, and easily. First, an apology. I apologize to all citizens of advanced civilizations that measure with the metric system. I apologize for the archaic use in the United States of the insufferably outdated English system of measurement, which even the British have abandoned. Hence I apologize for my obscure references to pesky unit of measurement called the pint. For the record: 1 pint equals approximately 500 mL. In practice, the metric equivalent of a pint container is not called 500 mL, but instead is called 500 grams, or half a kilo. Hence, 1 pint = a half kilo. Small fruits such as blueberries, fresh figs, and tomatoes (tomatoes botanically are fruits, not veggies) usually are packaged in plastic pint (500mL, half kilo) containers. Raspberries and blackberries come packaged by the half-pint (250mL, quarter kilo), which are half the depth but also useful. Rather than recycle or (gasp!) discard the containers, keep them. You likely eat mostly or only whole foods, so you soon will accumulate an abundance of plastic containers. The crucial features of these containers are the vents on their bottoms, and the lids on their tops. If necessary, rinse and dry them, then stack and store them. The plastic is recycle number 1 (PET or PETE), a polyethylene polymer predominantly used for water and beverage bottles, collectively called drink bottles. When heated or during prolonged storage, PET can migrate into its liquid contents. Hence the plastic taste of bottled water. At moderate room temperatures and for short durations, however, PET does not affect its solid contents. Hence blueberries and cherry tomatoes do not taste of plastic. Moist soil might be considered semi-liquid, in which case purists might wish to avoid use of plastic. 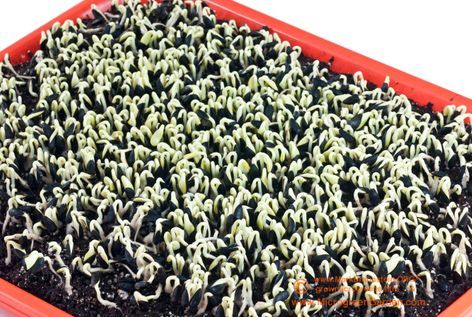 Pint-size plastic seedling pots can be found in the produce section of many food stores after all – filled with hydroponics-grown broccoli microgreens (though usually called broccoli sprouts). Yet if you intended to hire someone else to be your microgreens gardener, you would not be reading this right now. Repurposed plastic food containers do tend to fall apart after multiple re-uses, but you probably never will retain them that long. By attrition, you’ll be starting anew with a fresh batch of containers every three or four cycles. That’s because for every five or six containers that you grow, you likely will bestow one or two as gifts upon eager recipients. Regardless how unwise their eating habits, all your friends will love your microgreens. Even the microgreens that might taste unappetizing, still look beautiful. And many people eat only with their eyes. Cut off all the lids and save half of them. These very useful lids actually are lacking from commercially-produced seedling pots, so you have another reason to repurpose plastic food containers. Designate an old pair of scissors for cutting off the lids, as the blades soon will become dull from this function. If your collection of containers originate from different manufacturers, one manufacturer’s lids might not snugly fit another manufacturer’s containers, so to assure matching pairs later, you might consider marking them now. Double up the containers, and place one inside the other. They fit best if matched by manufacturer, but even containers of different origin usually fit remarkably well. Doubling up assures rigidity of the entire container so that the soil does not shift and thereby disrupt the fragile rootlets anchored in it. Also, this protects the rootlets from being crushed on the bottom where they cluster. And third, this empty space on the bottom prevents water from pooling at the bottom of the soil, and this extra ventilation along the underside of the container prevents mold. So here we skip all that, and proceed to watering the seeds. Water sprayed atop the seeds adds to the moisture they soak up from the soil beneath them. Kitchen sink handheld spray nozzles usually create torrential downpours that dislodge the seeds from their resting places in the soil, so first adjust the faucet to a mere trickle, then try the spray nozzle. Spray bottles pose no threat of flash floods. Fine misters are fine, but any spray bottle will do. You even can repurpose a spray container from a non-toxic household cleaner. To fully rinse away any residue, fill the container with hot water, allow the hot water to sit in it until cool, repeat twice, and residue will be gone. Smell and taste the spray to know for sure. Household cleaners packaged in spray containers cost barely more than new empty spray containers. So buy one spray container, and get the cleaner for free. Or buy two for the price of three, and get one free. Between crops, dismantle the sprayer from its container, stand the sprayer upside-down, and allow both to dry out, else bacteria or mold colonize them. Everything, including bacteria and mold, wants to grow. As the seeds lay naked atop the soil rather than buried below it, the seeds dry out quickly. Cloth or paper towel helps to retain moisture, so you need spray only once a day. Paper towel is not as suitable, as soaked seeds cling to it more than to cloth. Choose undyed cotton cloth that is thin and smooth and whose weave is wide, cloth such as from a bed sheet, not terry cloth such as from a bath towel. Cut to size a piece to fit into the container. It need not cover all the seeds, which makes the towel all the easier to cut to size. Lay it atop the seeds, then spray the cloth with water. For subsequent sprayings, it is possible to not remove or lift the cloth when you spray. Just be wary that you can overly saturate the soil but never see the puddle of water under the cloth to know it. Do not use cloth when starting mucilaginous seeds such as cress, chia, flax, arugula, and basil, else the seeds cling to the cloth rather than to the soil. For your first several crops, you likely will want to view the unfolding of the miracle of germination, so you may choose to postpone using cloth until later crops. Or just dispense with the cloth altogether. The cloths are akin to diapers, and some folks elect not to baby their seeds. Cover the seeds to retain moisture, and if needed to simulate darkness. If your vessel is a container, cover the container with its lid. You need not snap on the lid, instead simply place it atop the containers. Later removing the lid is much easier when you do not need to unsnap its corners. If your vessel is a tray, cover the tray with another tray, but inverted. You can trust your intuition or exercise your ingenuity here. Or you can skip ahead and read the chapters titled Warmth and Light. Check for signs of life. And check for signs of dryness. If the seeds look dry, then they are dry, so spray away. You soon will develop a very strong trigger finger. Without the top cloth or a layer of soil atop the seeds, you’ll need to lift the lid or top tray and spray twice rather than only once daily. While spraying twice a day may seem twice as bothersome, this still is less bother than burying the seeds under soil and then needing to pluck off or rinse away soil from harvested leaves. After two or three days, if the sprouts reach the height of the lid or top tray, it’s time to set them free. With warm temperatures, turnip and radish hit the ceiling by the second day, and most other seeds on the third. Some slower growers such as cilantro and dill take up to a week. Germination longer than a week usually disqualifies seeds from the ranks of microgreens. Depending upon warmth, your mileage will vary. With Container Gardening, In anticipation of the sprouts rising to the occasion, you can unsnap the lid and merely rest it on the container. Then when the sprouts reach the roof, they will lift up the lid and thereby provide you with a very clear sign that it is time to remove the lid altogether. Same for Tray Gardening, when the sprouts lift up the top tray, it is time to remove the top tray too (but with some exceptions, notably sunflower and pea). Once you remove the lid or top tray, expose your seedlings to the light of day. Watered from the bottom or the side, stems will not trap water, and so they far less likely molder or rot. Mold spores are everywhere, including on seeds and in soil, which is why most gardening seeds are treated with fungicides. As you grow only untreated sees, you must be ever vigilant for mold. All molds are fungi (but not all fungi are molds). Wheat rust, rice blast, and potato blight all are epidemics of fungi. Worldwide, as much agricultural crops are lost to fungi as to rodents or insects. You are unlikely ever to need to compete with rodents or insects for your microgreens. But if mold does take hold in your kitchen garden, be reconciled that your loss is a common malady, and be reassured that with proper precautions you can curtail it and avoid it. And you can take no better precaution against mold than to practice watering from the bottom or the side rather than the top. 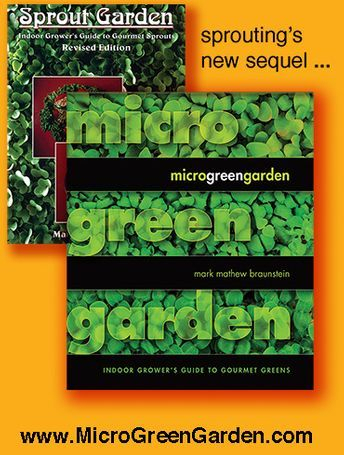 For further information: consult the chapters about Container Gardening (which enables bottom watering) and about Tray Gardening (which enables either side watering or, gasp, top watering) published in the book and eBook Microgreen Garden.